Left off exit and follow to the Post Road. 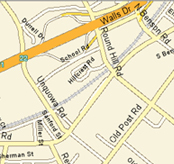 Right on Post Road for approximately 1 mile to Reef Road. Left onto Reef Road through the stop sign at Oldfield Road. 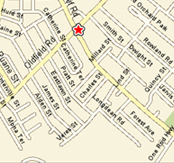 Our parking lot is an immediate left accessed off of Reef Road just after crossing Oldfield. Take 1-95 north to exit 21 (Mill Plain Road). Make a right off the exit and follow to the Post Road. Left onto Post Road for approximately 0.5 miles to Reef Road. Right onto Reef Road through the stop sign at Oldfield Road.